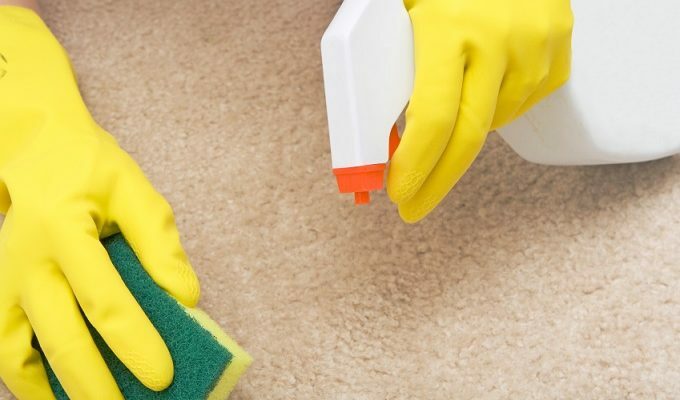 While no carpet is completely stain-proof, new stain-resist carpet treatments allow most spills to be removed when immediate action is taken and directions are followed carefully. 1. Immediately blot the spill with a dry, white towel, absorbent plain paper towel, or cloth. Do not scrub the area. Scrubbing can cause distortion of the carpet face fiber. Work from the outer edges to the center of the spill to prevent spreading. Continue to blot with clean towels to remove as much of the spill as possible. 2. Make an alkaline detergent solution of one teaspoon of liquid dishwashing detergent in one quart (32 ounces) of warm water. Never use a stronger concentration. Never use an automatic dishwasher or laundry detergent of any type as it may contain an optical brightener or fluorescent dyes that may adversely affect the carpet color. 3. Pretest any spot removal solution in an inconspicuous area of the carpet to make certain it will not damage the carpet fibers or dyes. After applying several drops to the test area, hold a white cloth on the wet area for ten seconds. Examine the white cloth for color pickup, color change, or damage to the carpet. If a change occurs, select a different cleaning solution. 4. After successfully pre-testing the cleaning solution, apply a small amount of the solution to a white cloth and work gently into the spill. Do not scrub. Most detergent solutions require adequate time to begin lifting the stain. Allow the detergent solution to remain on the spill for eight to ten minutes before attempting removal. 5. Blot, do not scrub the spill, working from the edges to the center to prevent spreading the stain. 6. Repeat the application of the detergent solution as long as the spill continues to transfer to the cloth. This transfer from the carpet to the cloth may be a slow process – be patient. Complete removal of the spill may require several applications of the solution. See the complete version of Carpet Spot Removal Procedure for Fruit Flavored and Sports Beverages.